Pope Francis walks next to Indian Cardinal Oswald Gracias as he leaves the morning session of the extraordinary Synod of Bishops on the family at the Vatican, Oct. 9, 2014 (CNS photo/Paul Haring). 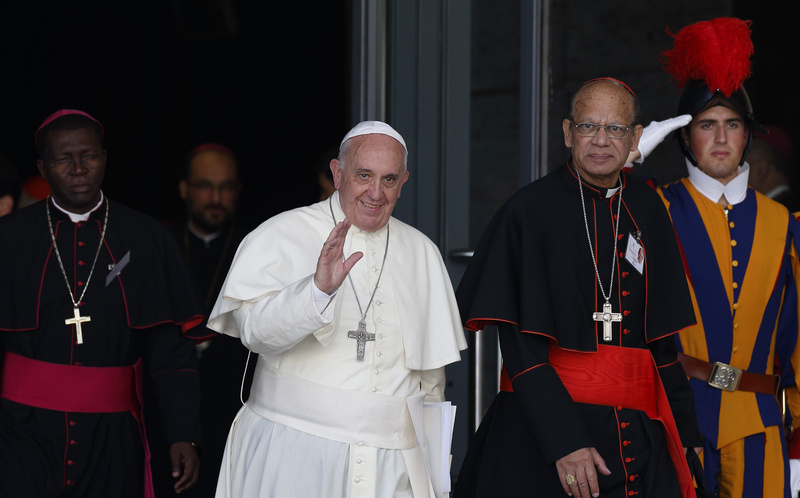 On the eve of the fifth anniversary of the election of Pope Francis, that is the assessment of Cardinal Oswald Gracias, 73, the first church leader ever to head the Catholic church in Asia and in India at the same time. In this exclusive interview he also talked about the possibility of the pope visiting India and China, as well as the work of the Council of Cardinal advisers. Cardinal Gracias is one of the nine members of the Council of Cardinal advisers established by Pope Francis. Born in Bombay (modern-day Mumbai) on Christmas Eve 1944, Cardinal Gracias has been the archbishop of the archdiocese of Bombay since 2006 and was made cardinal the following year. Since 2011, he has been president of the Federation of Asian Bishops Conferences—an apex body representing 19 bishops’ conferences comprising 28 countries in a continent where two-thirds of humanity live, but where Christians count for a mere 3 percent of the population and Catholics just 2 percent. Last month, he was elected president of the Catholic Bishops Conference of India, the umbrella organization of the Latin and two Oriental Rite churches in India, which represents some 200 bishops and around 20 million Catholics in the second most populous country in the world. He is also one of the nine members of the Council of Cardinal advisers established by Pope Francis to assist him in the reform of the Roman Curia and the governance of the universal church. What is it about the pope that you like, that Asians like? He comes across as a very authentic man. I see in the person of the pope, especially now being so close to him, confirmation of the presence of the Holy Spirit in the church. Benedict was the right person at the time of his election; John Paul was the appropriate person for that moment in history; and it’s so appropriate that Francis is pope today. He’s God’s gift to the church and to humanity. He’s speaking of peace and working for peace in a world that is getting ever more violent. He’s speaking of solidarity in a world where there’s so much poverty and suffering. He’s speaking of going to the peripheries and he’s giving us an approach of mercy and compassion, not throwing rules on people as bricks and stones. He’s the compassionate face of the church. A change of mentality was necessary, and the Holy Father is leading the church in that direction. I see the pope can really touch the heart of Asia, a continent where the people are basically spiritual even though they are now also becoming somewhat secularized. I know that all his trips to countries in Asia— South Korea, Sri Lanka, the Philippines, Myanmar and Bangladesh—have made a significant contribution to our spiritual growth. For example, on his recent visit, the Holy Father gave strength to the church, which has 600,000 Catholics in Myanmar and 700,000 in Bangladesh. By his presence he encouraged them, showed that he supports them. I think he will also touch the hearts of people when he comes to India. Do you expect him to visit India? Prime Minister Narendra Modi told us he would very much like for the pope to come. The difficulty is to find an appropriate time, partly because many other distinguished people are coming and because we are having so many elections. The Holy Father would not want to get involved in local politics. So, we are trying to find a time that is neutral for him to come, without people instrumentalizing his visit. I am hopeful that in 2018 we will be able to arrange this visit, maybe between September and November. Do you see him going to China? I am almost confident that he’s coming to India. When you speak of China, I see a glimmer of light, of this possibility. It’s not ruled out; his desire to go is strong. You have participated in 23 meetings of the Council of Cardinal advisers to Pope Francis. Where are you at on that agenda? We’re coming to the end of one project—the reform of the Roman Curia. I hope we can finish it this year. Our minds are clear, it’s a question of formulating [the constitution on this reform] in canon law. But beyond structural changes, what the pope wants to bring about more than anything else is a change of mentality in the Curia, to make it be at the service of the Holy Father and of the local churches. The Curia can help the Holy Father in making the whole church a synodal church, and that should influence all of us bishops in our dioceses to make our respective dioceses synodal dioceses. The Holy Father wants the Curia, and us bishops, to be attentive to those on the periphery; he speaks about that; he shows this by his actions. What are these meetings of the council like? Our meetings are so harmonious, we’ve become of one union, they are joyful meetings, full of hope, and I hope the Holy Father also feels supported by us. He’s listened a lot. He comes to all our meetings. He’s a very interested participant and intervenes every now and again. He asks questions and gives his own opinions sometimes, though he doesn’t want to push us in a specific direction. I see in him a leader who feels supported by us, and I’m happy about that. Pope Francis has so many ideas for the governance of the church. This [reform of the curia] is just one part. The work will continue once this is finished and focus on other issues of the church, on the broader issues of the governance of the church: dioceses, questions of decentralization, collegiality of bishops, synodality, episcopal conferences and how they can be strengthened. We will also discuss how to face problem situations, crisis management. We’ve already given much time to the whole question of the protection of minors and the question of migrants, and we’ll continue to do so. It’s clear the Holy Father wants to keep in touch with the reality on the ground in the world. Sorry Cardinal Gracias, I am from Asia and Pope Francis DOES NOT appeal to me. I have problems about him washing womens feet on Holy Thursday, his publication Amoris Laetitia, his very obvious bias of practicing favouritism towards Muslims and a whole host of other issues which frankly sickens me. He may be a favourite of India and others but I just wish Cardinal Burke or Cardinal Sarah had been elected Pope. Anyway this is just my opinion and I believe I have a right to it.